"It went bang!" exclaimed Barney, a rabbit who lives nearby. Interesting thing happened tonight. Not only did I accidentally pour dish soap into the dishwasher (yes, I know), two bottles of Pellegrino exploded in my fridge. Call it ‘applied physics’ if you like; water expands when it’s frozen, fizzy water explodes when frozen in a glass bottle! Hmmm… I never said my Ph.D. was in Common Sense… But in my defence, how was I supposed to know it was that cold in my refrigerator? Barney was a little shaken from the loud bangs, but I think he’ll get over it (actually, he is over it, nom nomming on a bit of banana for his troubles). It's a premonition of 2012? Those bottles look awfully Mayan to me.. I am concerned. Your fridge appears to contain only water and a paper bag. Though at least Barney is eating well! Bizare, same thing happened to us. Only the Pelligrino bottle was frozen and exploded in the fridge. Other fluids and a bottle of water were not frozen. In fact, some of the Pelligrino that was released in liquid form froze on all 3 shelves below the top shelf where it exploded. The fridge temp was definitely not below freezing. 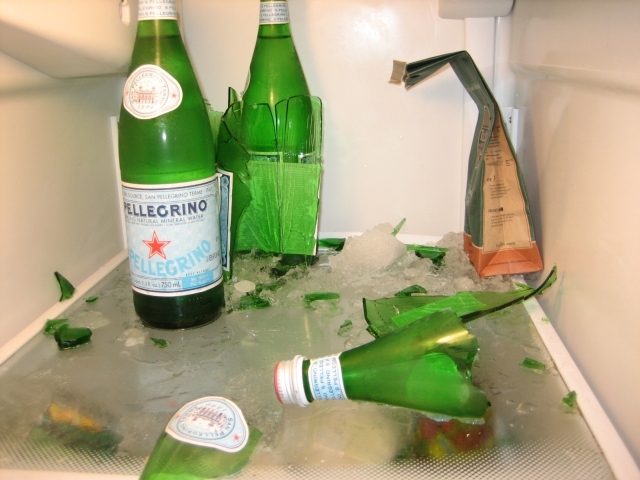 In fact, some of the Pelligrino that was released in liquid form froze on all 3 shelves below the top shelf where it exploded. The fridge temp was definitely not below freezing. I think you should turn the temperature setting up slightly on your fridge! (: At least no one was hurt – thats the main thing.